The painting is signed and dated “Lorenzo Loto 1534” at the bottom of the cushion where St. Anne and the Virgin are reclining. The artwork is documented in 1713 as part of the celebrated collection of the Grand Prince Ferdinando de’ Medici and has been in the Uffizi Galleries since 1798. The canvas represents one of Lorenzo Lotto’s first paintings a few months after his arrival in the region of Le Marche and its dating makes it a staple for the timing of the painter’s artistic activity over the fifteenth thirties. The current poor condition of the painting totally prevents the appreciation of its high pictorial quality. 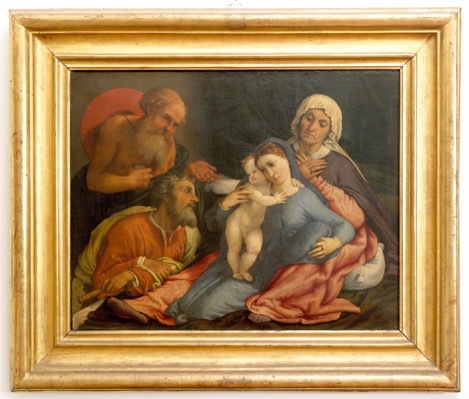 The acid tonality of the colors and the hues of cold light – characteristic of Lotto’s production between 1532 and 1534 such as The Holy Family with St Catherine of Alexandria of the Accademia Carrara in Bergamo – are completely hidden by the thick layers of aged varnish and extraneous materials accumulated over time. A version of the same painting, once in the Seilern collection, is at the Courtauld Gallery in London and differs only for a part of landscape in place of St Jerome. A comparison with the painting of the Uffizi, finally grime-free, will allow a better appraisal in the debated question about which of the two artworks is the original prototype.